As the temperature rose to 93 degrees the afternoon of July 25, Jeff O’Rear, an 18-year veteran of the Kansas City Police Department, and his partner, Erik Winter, responded to a call about a dog that had been left inside a car in a shopping center’s parking lot. They had no trouble locating the car. It was surrounded by a group of people. “Everybody around us was crying and screaming. They were upset,” O’Rear told the Kansas City Star. When the police officers saw what the crowd was looking at, they became upset as well. Inside the car, where the temperature had risen to 140 degrees, was a tiny, 5-month-old Chihuahua mix. He was laying on his back in his kennel, his tongue sticking out. Surveillance videos showed the dog had been left inside the car, with the windows rolled up, for nearly two hours. Using their batons, O’Rear and Winter smashed the car’s rear window and removed the dog. They rushed him over to the nearby Banfield Animal Hospital inside the shopping center’s PetSmart. The dog’s internal temperature was 107 degrees (a dog’s normal temperature is 99.5 to 102.5 degrees). His heart rate was a rapid 200 beats per minute, far above the norm of up to 140 beats. 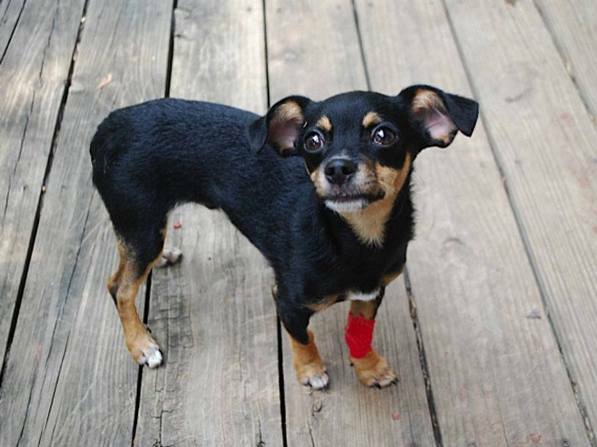 As he was being treated, the little dog’s temperature dropped to 94 degrees and he went into shock. But just 24 hours later, the dog was eating, drinking and on his way to a full recovery. According to KCTV, four other dogs were rescued from hot cars that same day — tragically, two did not survive. Even with the windows cracked open, the temperature inside a car on a warm day can quickly rise. If you see a dog inside a hot car and can’t find the owner, call 911. O’Rear told KCTV that if you break a window to save the dog, you probably won’t be cited, although the owner could slap you with a civil lawsuit. Last month, Tennessee passed a groundbreaking law that allows anyone to break a car window if an animal is suffering inside, without being punished for their good deed. Hopefully other states will do the same. The Chihuahua’s owners, a married couple from Carrollton, Mo., was cited with a misdemeanor charge of animal cruelty. On Wednesday, O’Rear surprised his daughters when he took them to KC Pet Project’s Zona Rosa shelter to meet their new family member: the Chihuahua he’d saved. The pup’s original owners had signed him over to O’Rear. 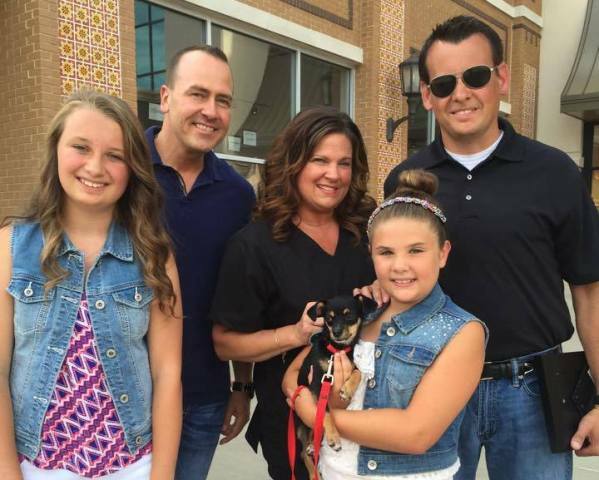 “The family, including grandparents, uncles and aunts, representatives from Banfield Pet Hospital at PetSmart who helped stabilize him after they pulled him from the car, the partner of the police officer, and many members of the local media were present for the fun surprise and the happy adoption,” KC Pet Project wrote on its Facebook page. The dog has a feline playmate — a cat who O’Rear helped rescue from a sewer five years ago. Last week, O’Rear and his fellow officers received the Compassionate Police Department Award from People for the Ethical Treatment of Animals (PETA). It’s a sure bet this is just the first of many accolades that will be coming their way.